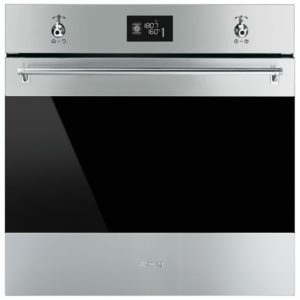 Offering great performance and style, this fantastic single oven from Smeg is sure to be a great addition to busy kitchen. There's a roomy 70 litre interior, with 9 cooking options to choose from, so you are covered for everything from your roast dinner to creating that perfect birthday cake. Easy to use thanks to the LCD screen and illuminated controls, and easy to maintain with a pyrolytic cleaning function, which burns away grease and food so all that's needed is a simple wipe down. Finished in white, this oven has a stylish exterior and is ready to fit in a modern kitchen. 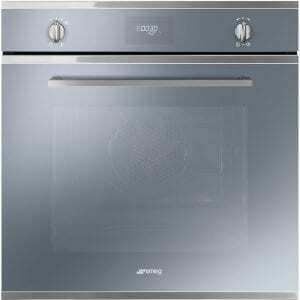 This sleek Linea multifunction single oven from Smeg has a variety of cooking functions, available. Circulaire is one of those functions, it evenly distributes heat for brilliant cooking results without transfer of flavour, even if you are cooking multiple things at the same time! Rapid pre-heating means you will save time in the kitchen and the A+ energy rating means you will save money on your energy bills! 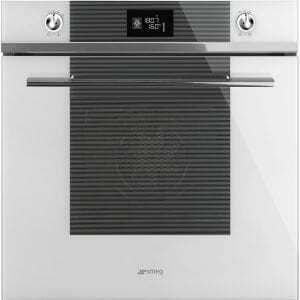 An extra deep tray, chrome shelf and grill mesh will be supplied as standard with this appliance. The white glass finish is incredibly stylish, whether installed in a tall housing unit or built under a worktop. 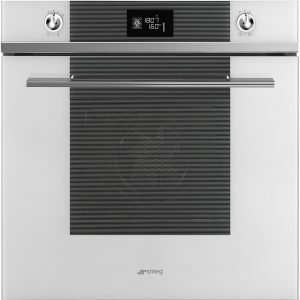 Great for aspiring chefs and kitchen novices, this fantastic single oven from Smeg is sure to help you create some fantastic meals! There are 9 functions to choose between, including Smeg's Circulaire function, which evenly cooks and there's no transfer of flavour, even if you are cooking different foods at the same time. Eco Logic allows you to control the efficiency, while Pyrolytic cleaning takes the hassle out of cleaning the oven, burning away food and grease to an ash so the oven only requires a wipe down. With 70 litres of space there's plenty of room for all your favourites, while the sleek design and stainless steel finish mean it will really fit in a modern kitchen. Boasting an A energy rating, 70 litres of cooking space and 9 cooking functions, this stunning Cucina oven from Smeg is a great addition to a modern kitchen. Finished in silver glass, it has a great visual appeal, and thanks to the easy maintenance interior, it will keep looking good! Pyrolytic cleaning means that the interior will heat up and burn away any grease or food, so any ash formed just needs wiping away when it's finished. Whether you are just grilling some bread or cooking a roast, there are great cooking functions, so you can pick the perfect one for every meal.